First on the list was Kent Schnepp, CEO of Odysys, a company that uses a unique software platform to help hotels increase their customer base and bookings process. Kent was a very busy guy on the day I showed up for the shoot (which is a good thing!! ), but very easy-going and ready to entertain my ideas for some portraits. It's a great feeling to earn the quick trust of a client or subject...being in front of the camera is not a comfortable experience for a lot of people (myself included!). Odysys is based in downtown Bend in the 1000 Wall Building, an amazingly renovated historic space with many options for backgrounds and setups. We wanted to get some detail and environmental "situational" images of the Odysys workspace and featuring their product. Sometimes it can be quite a challenge to "feature" a digital software platform, but I think we made it happen! I was immediately drawn to the wall of "taped up" papers and layouts...I'm a big whiteboard fan and a visual organizer, so this was a setting after my own heart. I set up a classic "workplace-feel" portrait here with several usage options, including a portrait orientation for a possible cover. The next phase of this assignment was a trip over to The Wilds -- a soon-to be completed art-studio/workspace for creatives on the West side of Bend. Three collaborative women are behind this venture and we spent some time building a portrait of them in their space that was still itself being created. The three owners (pictured below, in L-R order) are Kelly Thiel, Karen Ruane, and Wallis Levin. I started out with some basic available light images standing in the large roll-up doorway of the space. I added a hint of accent from a small flash in the background, mainly to light the interior of the space just a bit, so they were not standing in front of a pitch black "cave". Knowledge and experience with location lighting and having gear that is dependable and lightweight gives me so many more options of how to solve creative problems or interpret things differently. The assignment originally called for a lot of documentation of the details of the space (which we discovered had not yet been finished), so I improvised a bit with these portraits themed as a combination of awesome potential space with these creative minds at the center of it. Finally, this job took me to Cascades Academy, a beautifully-designed, independent private pre K-12 school here in Bend, Oregon. 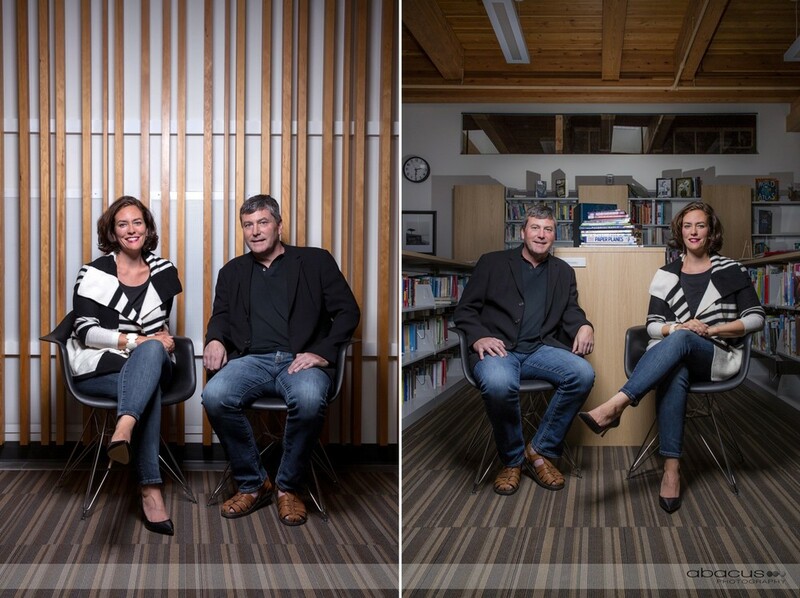 My last portraits for this series were with the co-founders of a digital start-up company called Handsell. Molly Scofield and Dave Mullan are launching a mobile application that works in conjunction with social media communities (Facebook, etc) to provide an improved way to buy, sell, and trade online. Pretty awesome idea and they work a lot with connected groups that already exist, like a school's PTA or parent groups, and even geographical neighborhoods. So, in the concept phase of this part, we decided to use the Cascades Academy interior for some imagery since this is one of their communities testing the app. Using the design elements of the building was fun and I could've stayed there all day. The library and a classroom set the backdrop for a few shots and then we moved out into the searing Central Oregon heat that day for a quick simple set up against the symmetrical wood siding of the building. Having a great combination of simple and clean backgrounds allows for a focus on the subjects themselves, while environmental settings tell a story or enhance a particular theme of the associated article...and in this case I was able to find and capture both! This was a great assignment overall and allowed for the great combo of editorial assignment photography that I love--meeting and interacting with interesting people, problem solving the technical part of image creation on locations, and the excitement of creativity in the moment as my mind works to "find the images" that are both needed by the client and that make me happy to be a photographer.